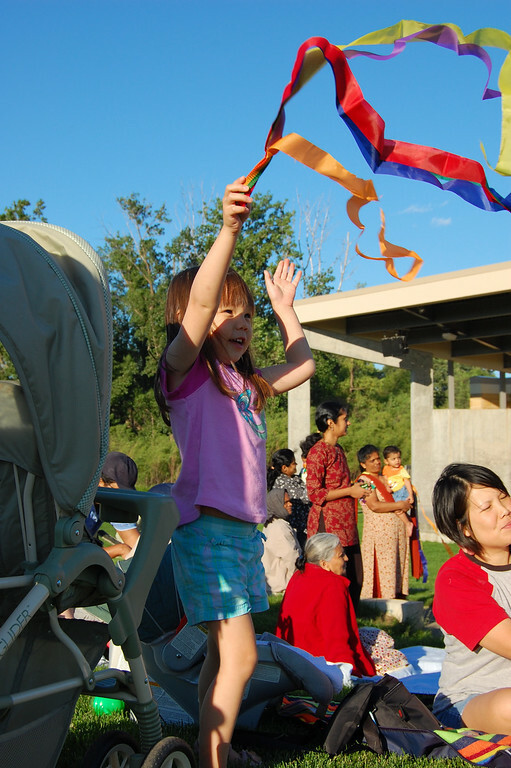 classes hold and wave about as they experience rhythm and motion. good way to use up the odd remnants in one's ribbon stash. And because they were so simple and fast to make, here's a tutorial. 1 yard of each ribbon, all of the same width, and at least 1" wide. Satin is a nice choice but it's more expensive. I used 1" grosgrain because it was what I had a lot of. They tend to be heavier and less floaty than the thin polyester streamers the commercial ribbon rings come with but they still swish about nicely. 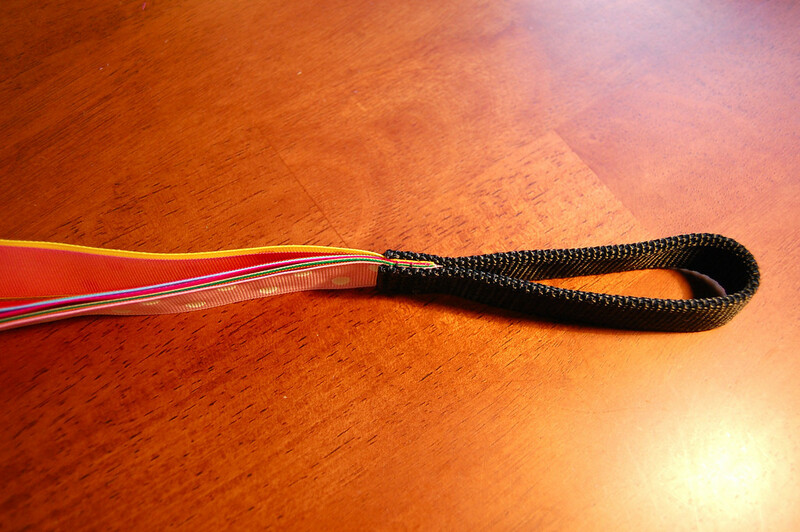 11" of nylon strap - the sort that duffle bags come with. 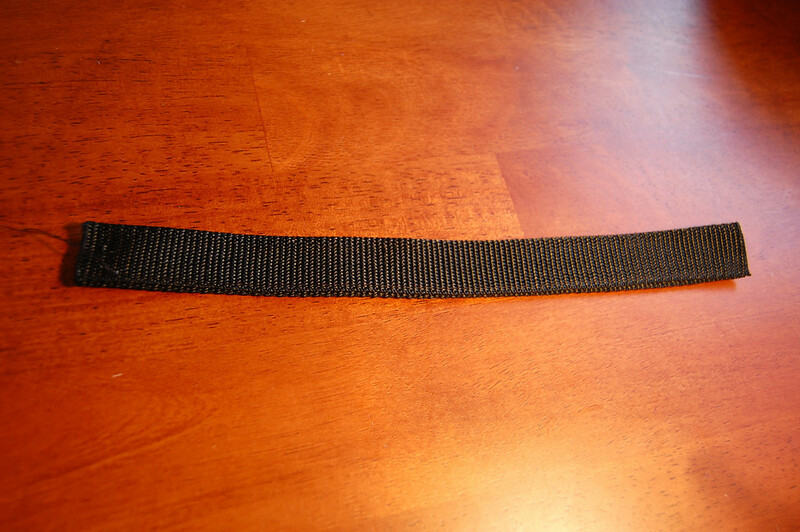 The width of the strap should be twice that of the ribbon. Mine was 2". 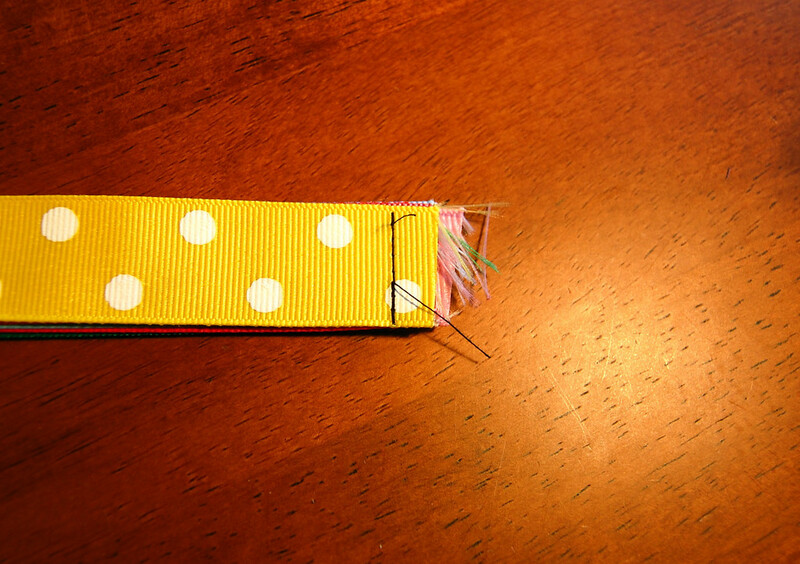 Take one ribbon and singe one end to prevent fraying. 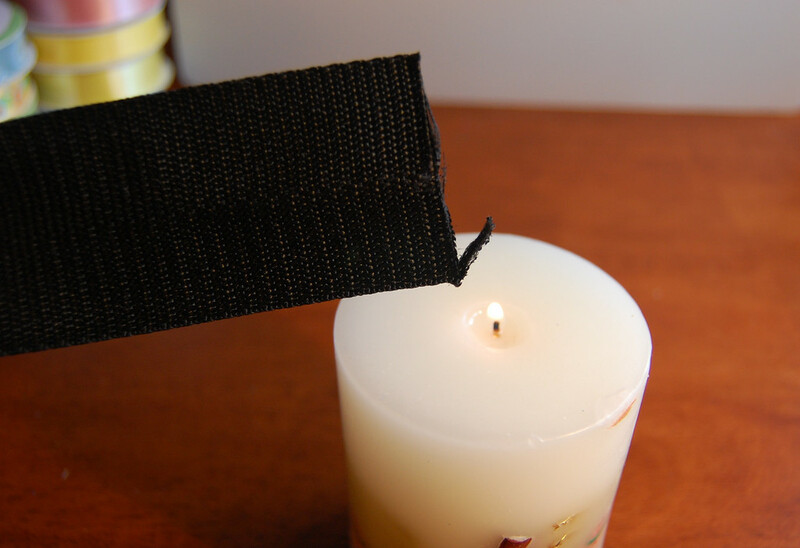 To do this, hold the end about an inch above the flame as shown. 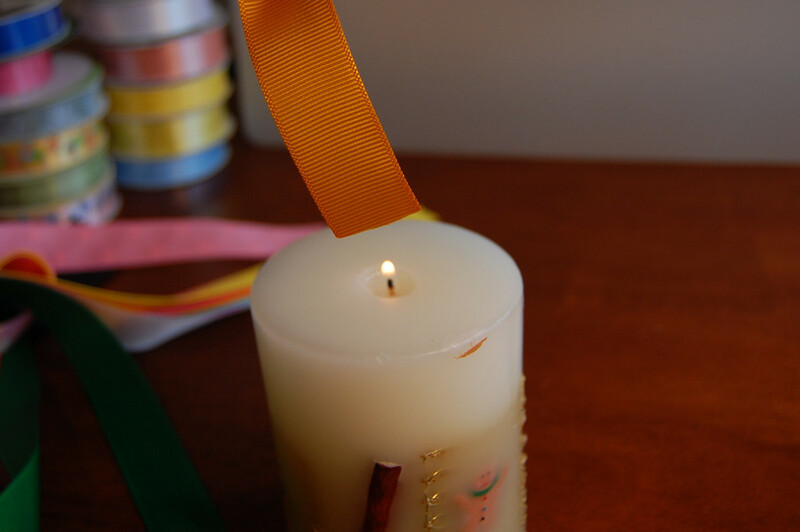 Move it horizontally sideways so that the flame singes the entire width. If nothing happens, lower the ribbon edge slightly and repeat. If the end melts and distorts, you're too close! Snip off the bad bit and start again. Repeat for all the ribbons. 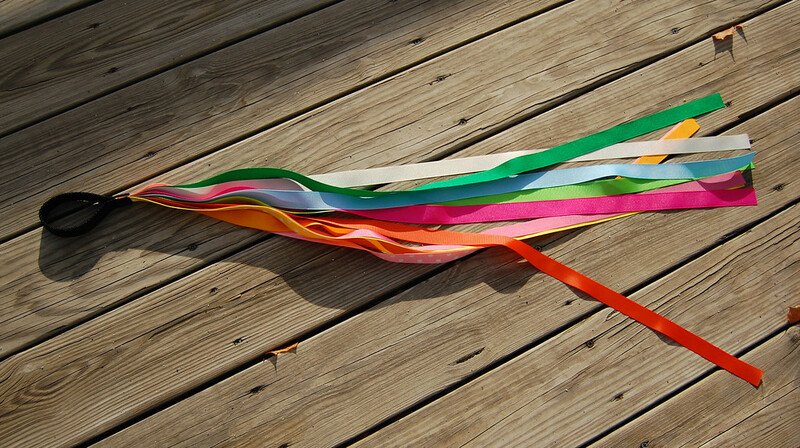 Remember, you are going to singe only one end - these will be the exposed ends of the ribbon-streamers. 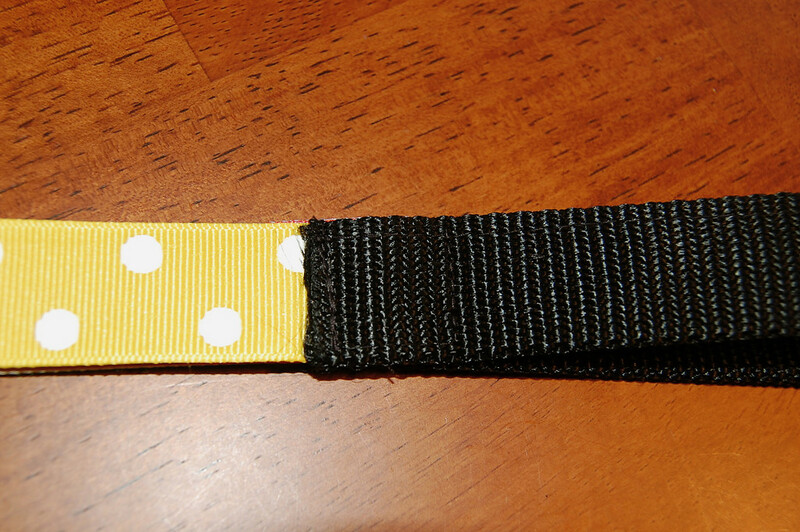 The other end of each ribbon will be tucked into the strap-loop and doesn't need to be singed. 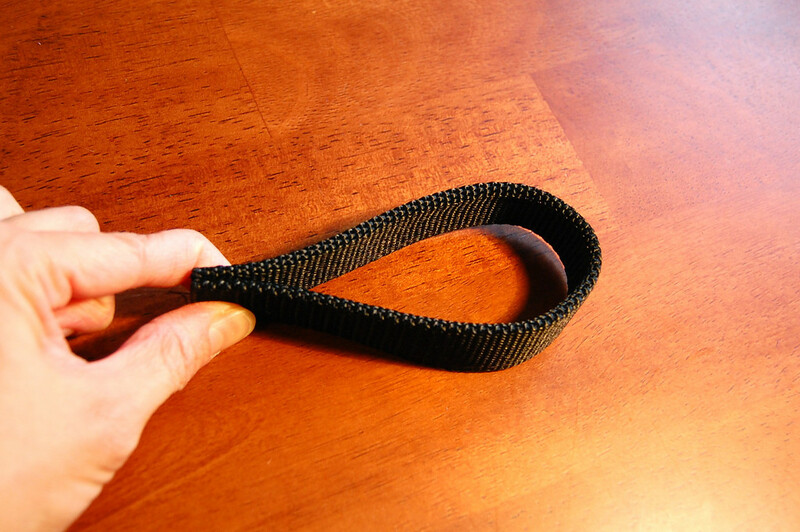 Repeat this for the nylon strap, but singe both ends. Now find all the un-singed (i.e. 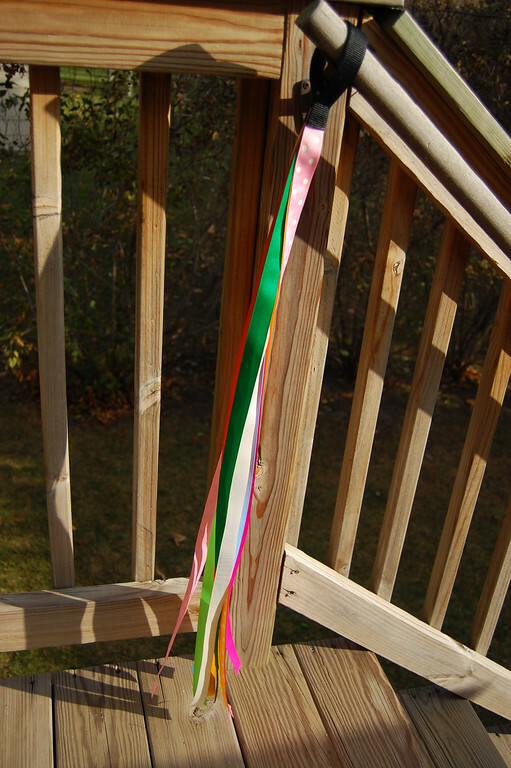 still fraying) ends of the ribbons and stack them together as shown. 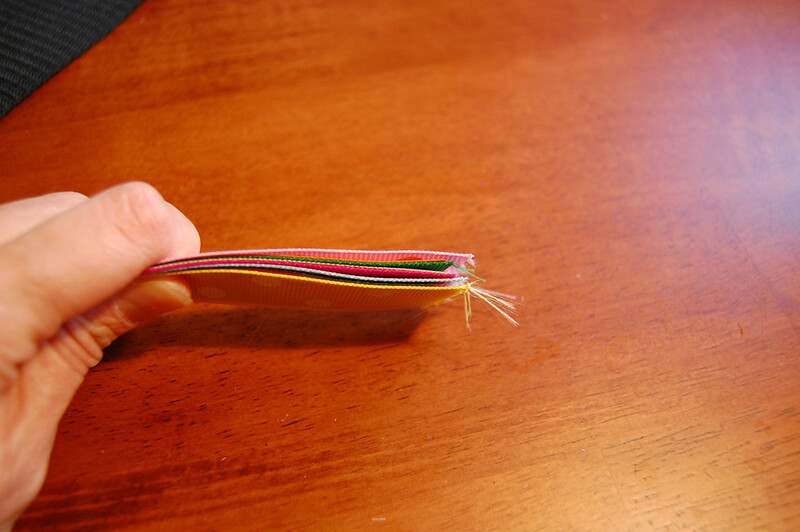 Sew a line of stitching about half an inch from the end to secure them together. 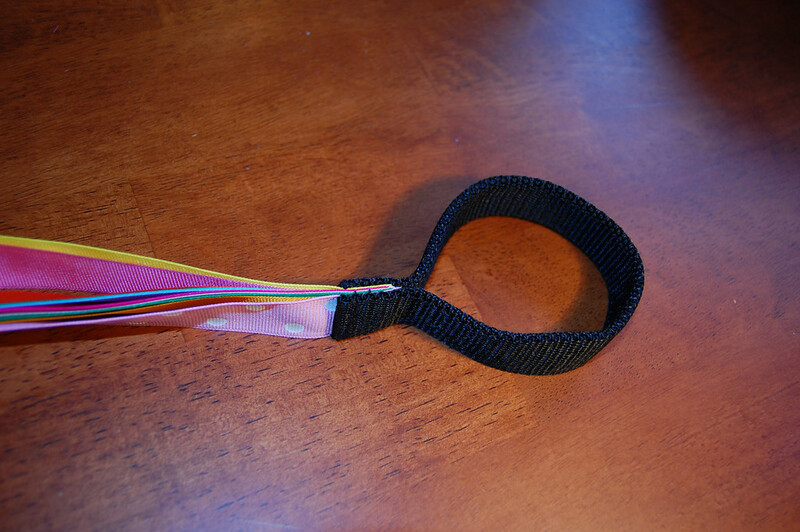 Take the nylon strap and fold it in half lengthwise. You may need to hold it down and press hard on the crease to make it stay folded. 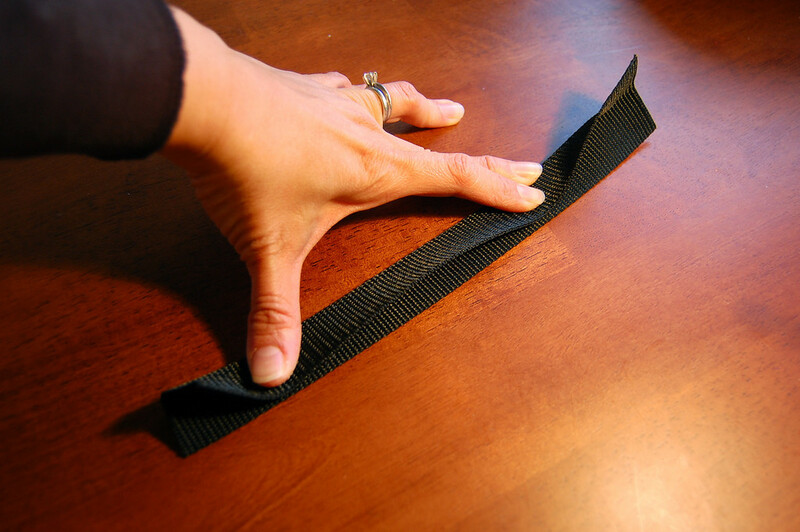 Sew a line of stitches close to the open edge to secure it in folded position permanently. 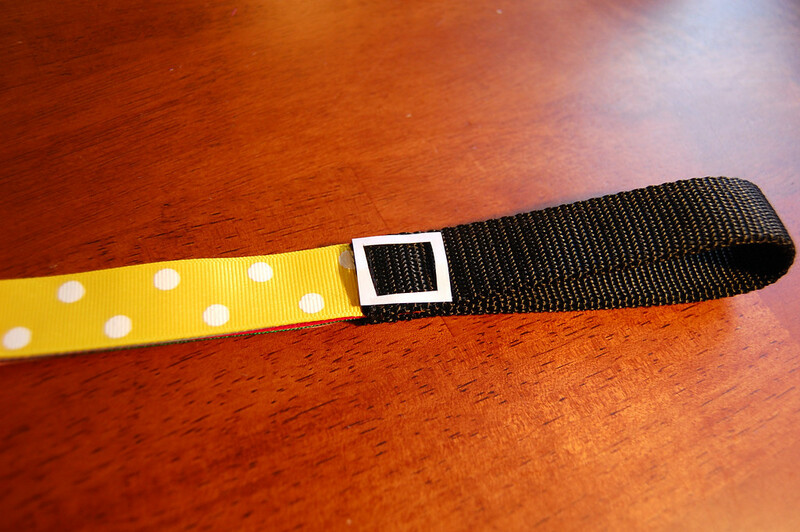 You now have a double-thickness, half-width nylon strap. it will straighten itself out in the next step. 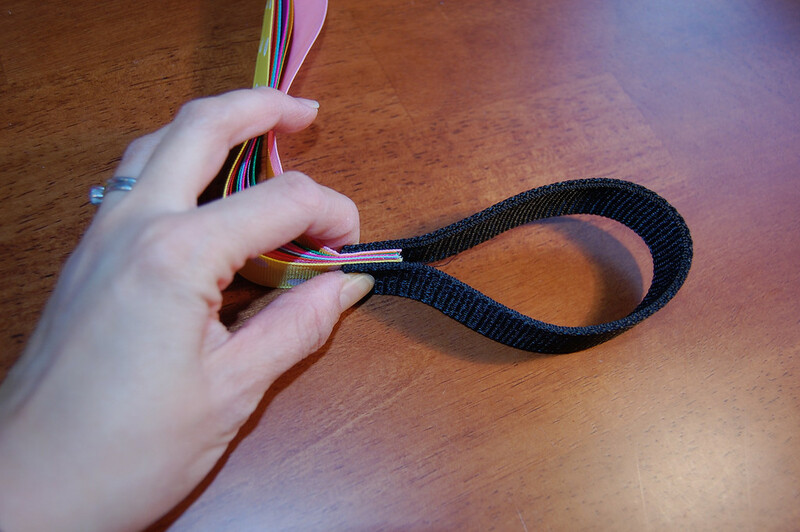 Fold the sewn strap in half to make a loop. 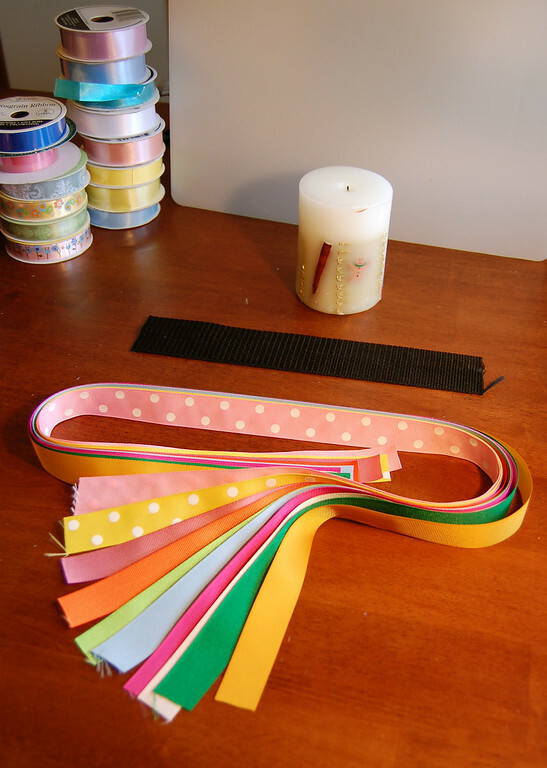 Take the sewn end of the ribbon stack. Insert it 3/4" deep between the ends of the loop. 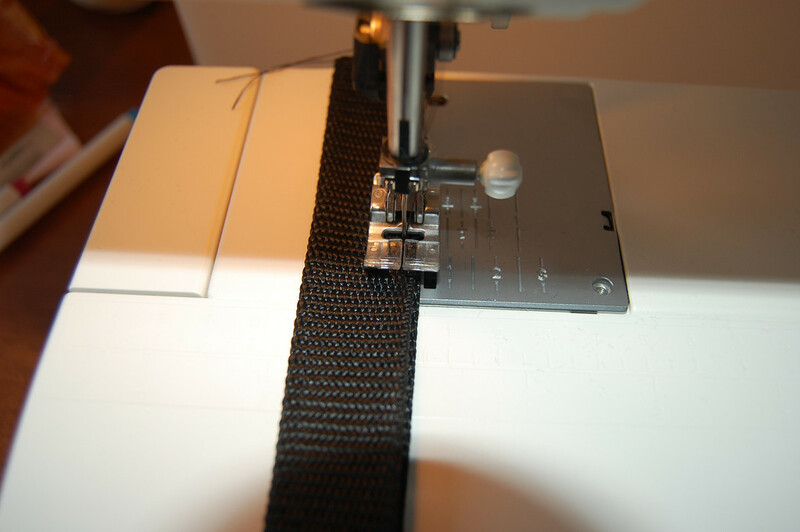 Lay this "sandwich" flat and sew a square of stitching to secure it. In the picture below, the white square shows where to sew. Make the square (or rectangle) long enough so that the fraying edges of the ribbons are enclosed within the square (or rectangle). A (not as useful as I'd hoped) close-up to show the stitches. in a loop for little hands to hold. but you can't singe it to prevent fraying. You'd have to serge the edges or use bias tape. This is fabulous! Great tutorial. I'll be searching through my ribbon box today! Hi! I found your blog off homemadebyjill's. I hope you don't mind my peeking but I wanted to tell you I love all your crafts. You are so creative and talented. Hope you don't mind my taking a peek every now and then? Your daughters Halloween costume is beautiful. THanks so much for this post. I wanted to do something pretty for my daughter's bday and this is a great idea that will do well with regular paper streams and oaktag for handle. 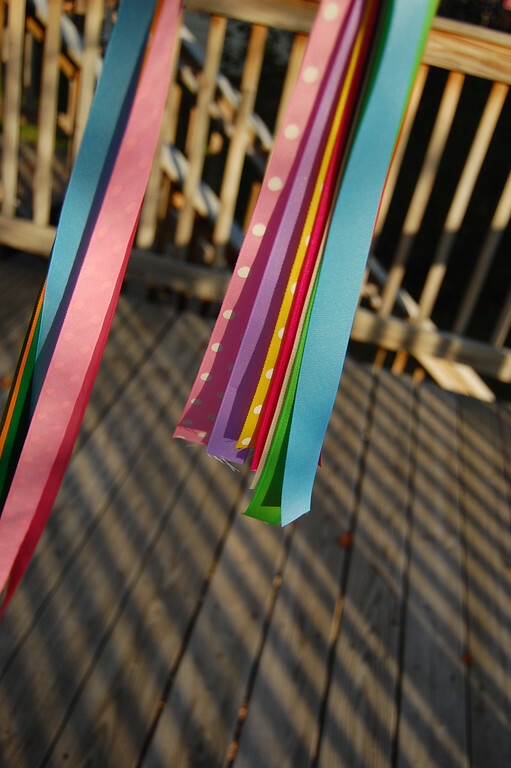 As I don't have all those pretty ribbons, crepe paper streamers will have to do. Thanks so much! I'll let you know how they came out. I love this idea and glad I came across it online. Thanks for Sharing.